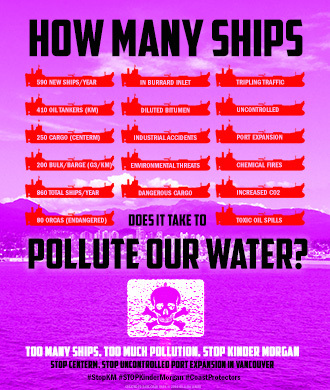 The number of ships navigating through Vancouver’s Burrard Inlet and the Salish Sea is about to triple. With Canadian government approvals for Kinder Morgan and the Global Grain Group (G3), and pending approval of the Centerm expansion near downtown Vancouver, the number of ships is expected to grow dramatically from 266 to 860 ships per year. What are they thinking? How many ships does it take for something to go wrong? One accident with a Kinder Morgan Oil tanker carrying diluted bitumen — dirty tar sands oil — and our beautiful coast could be destroyed. 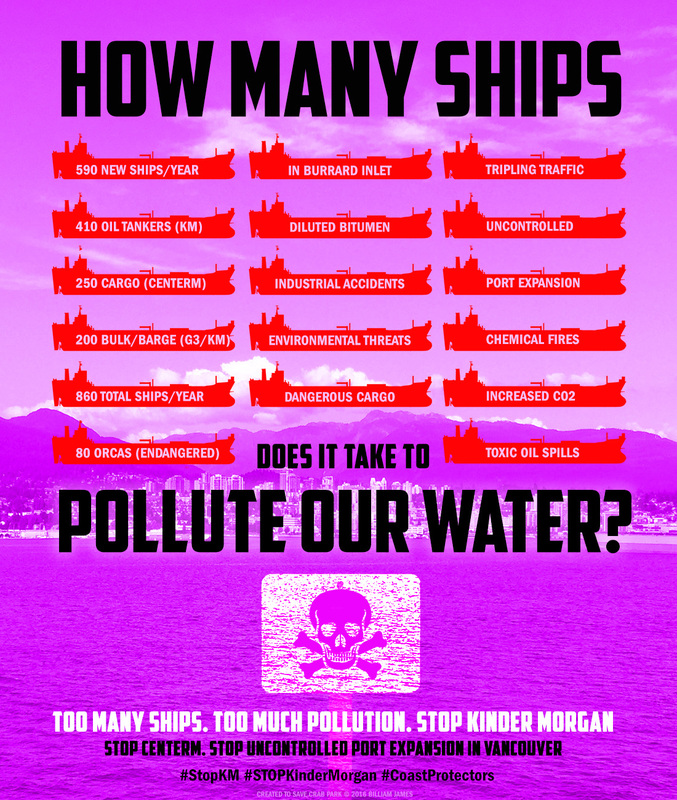 With almost three ships sailing through the Burrard Inlet everyday, the water will be contaminated with more ballast water and leaking engine fuels and chemicals. 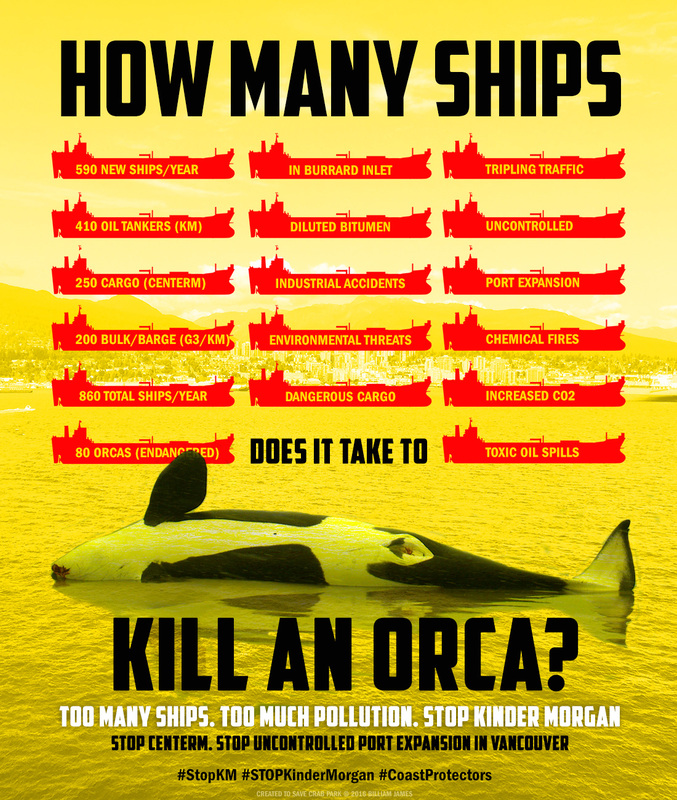 With scores of giant industrial ships chugging through the Salish Sea constantly, marine mammals — like the endangered Southern Resident Orcas in the Salish Sea — will become disoriented and lost because of pervasive sound pollution from the ships, which harms their ability to navigate and communicate. With hundreds of ships burning low-cost bunker fuel our air will be polluted with even more carbon and particulate matter. 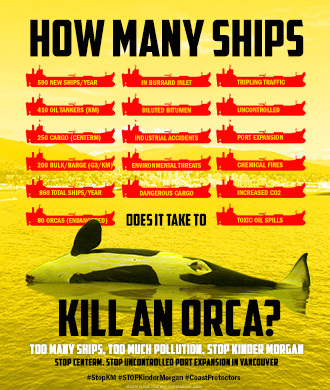 These statistics are based on the published estimates by Kinder Morgan, Trans Mountain pipeline and the Port of Vancouver. * Projected numbers for ships are rounded to the nearest ten (10). ** Centerm terminal near downtown Vancouver is proposing to expand from “current 900,000 TEUs to up to 1.5 million TEUs”. A TEU (Twenty Foot Equivalent Unit) is the unit of the capacity of a container ship. If we assume average docked ship carries 6,000 TEUs, then we can estimate that currently 150 ships/year expanding to 250 ships/year. In fact between Nov 20, 2016 – Dec 20 2016, DP World Vancouver has scheduled 26 Vessels docking at Centerm, which is about 300 ships/year! The bottom line: Too many ships. Too much pollution. 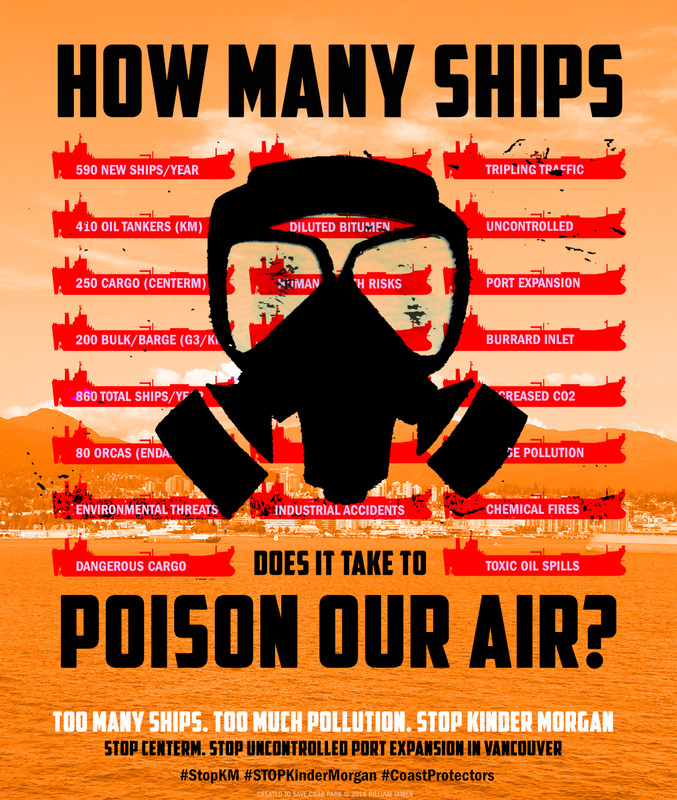 We need to #STOPKinderMorgan. #StopKM! We need to stop the expansion of Centerm, because we don’t more industrial accidents and pollution. 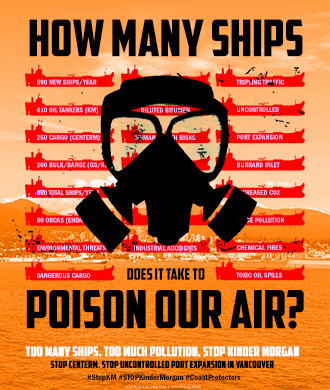 We need to stop the uncontrolled port expansion in Vancouver. It’s not worth the risk.